NASA/JPL-CaltechAn illustration of the Cassini spacecraft over Saturn’s north pole with its hexagon-shaped storm. The Cassini spacecraft, which launched toward Saturn in 1997, is running very low on fuel. To avoid running out and accidentally crashing into and contaminating a nearby moon that may harbour alien life, NASA is going to destroy the robot. Before Cassini perishes, however, it will fly between Saturn and its rings and record as much new data as possible. Called Cassini-Huygens — or Cassini for short — the golden nuclear-powered spacecraft launched in October 1997, fell into orbit around the gas giant in July 2004, and has been documenting the planet and its dizzying variety of moons ever since. But all good things must come to an end. And for NASA’s $US3.26 billion probe, that day is Friday, September 15, 2017. During a press conference held by the US space agency on April 4, researchers explained why they’re killing off their cherished spacecraft with what they call the “Grand Finale.” The manoeuvre will use up the fleeting reserves of Cassini’s fuel, putting it on a collision course with Saturn. NASA/JPL/Space Science InstituteFalse-colour image showing plumes erupting from Enceladus’ surface. 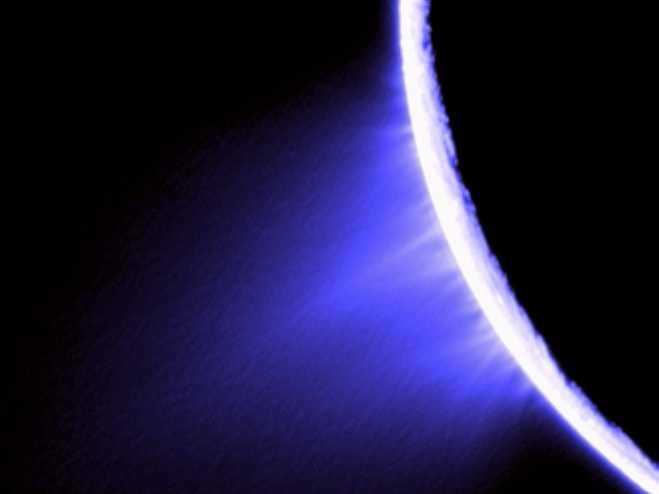 Maize was referring to a warm, saltwater ocean that Cassini found hiding beneath the icy crust of Enceladus, a large moon of Saturn that spews water into space. NASA’s probe flew through these curtain-like jets of vapour and ice in October 2015, “tasted” the material, and indirectly discovered the subsurface ocean’s composition — and it’s one that may support alien life. However, Maize and a collaboration of researchers from 19 nations aren’t going to let their plucky probe go down without a fight. Their goal: get lots of chances to record unprecedented new images, gravitational data, and magnetic readings without putting the spacecraft into harm’s way or burning up too much of its limited propellant. But after 13 years of operation at nearly 1 billion miles (1.45 billion kilometers) away from Earth, Cassini’s tank is running close to empty. “We’re coming to the end. As it runs out of fuel, the things it can do are quite limited — until we decided on a new approach,” Jim Green, the leader of NASA’s planetary science program, said during the press conference. NASA could have propelled Cassini to some other planet — perhaps Uranus or Neptune. But in 2010, mission managers decided to keep it around Saturn, reasoning they could squeeze more science out of the mission there. However, this effectively doomed the spacecraft to a fiery death. Cassini’s death spiral will officially begin on April 22, 2017. That’s when it will, for the last time, fly by Titan: an icy moon of Saturn that’s bigger than our own, has a thick atmosphere, seas of liquid methane, and even rain. Titan’s gravity will slingshot Cassini over Saturn, above the planet’s atmosphere, and — on April 26 — through a narrow void between the planet and the innermost edge of its rings. NASA/JPL-CaltechAn illustration of Saturn’s internal structure. NASA/JPL-Caltech/Space Science Institute; Jason Major/Lights in the DarkSaturn’s hexagon-shaped jet stream at the planet’s north pole. During its final orbits above Saturn, Cassini will get its closest-ever views of the hexagon-shaped feature of Saturn’s north pole, which Spilker said is “two Earth diameters across” yet poorly understood. “Perhaps by getting close with Cassini, we’ll answer the question, ‘What keeps the hexagon there in this particular shape? '” she said. Spilker said Cassini will also photograph the auroras of Saturn’s poles, measure how massive the planet’s rings are, “taste” the icy material they’re made of, and even probe deep below its thick clouds to see how big its rocky core is. Sensitive magnetic and gravitational measurements that Cassini couldn’t make before may also answer lingering questions about the internal structure of Saturn, including how big its rocky core is, plus how fast a shell of metallic hydrogen around it spins. Cassini is a 2.78-ton robot with delicate instruments that was not designed to ram into icy ring material at 70,000 mph. It also wasn’t made to plunge into the thick atmosphere of a gas giant and live to tell the tale. Nevertheless, scientists behind the mission say they are going to do their best to shield its instruments from damage and keep the data flowing until the moment it dies. NASAThe Cassini spacecraft being prepared for flight in 1997. They will do this primarily by using the cone-shaped primary antenna as a shield to protect cameras, magnetometers, and more. When Cassini begins its final plunge, it will use its last propellant to fight atmospheric drag and keep the antenna pointed at Earth. During that time, it will “taste” the composition of Saturn’s atmosphere as it descends into the gases, broadcasting its readings in real-time back to satellite dishes on Earth. But the measurements won’t last long. “It will break apart, it will melt, it will vaporise, and it will become a very part of the planet it left Earth 20 years ago to explore,” Maize said. While members of the Cassini team said they’re looking forward to the Grand Finale, they weren’t without remorse.